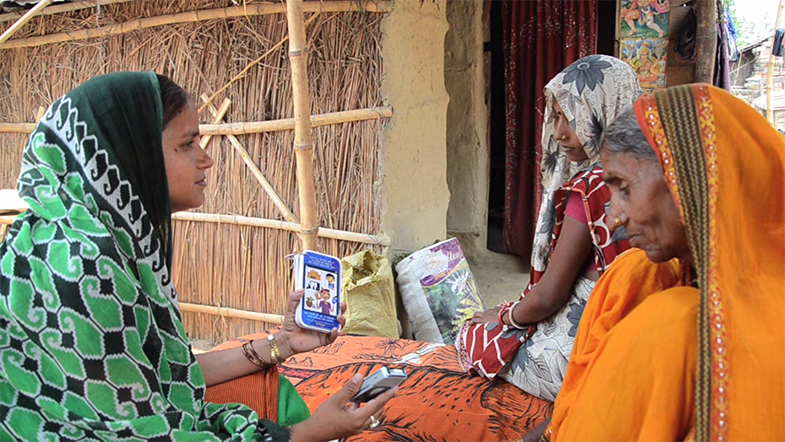 Mobile Kunji is an audio-visual job aid for community health workers working in maternal care in rural India. 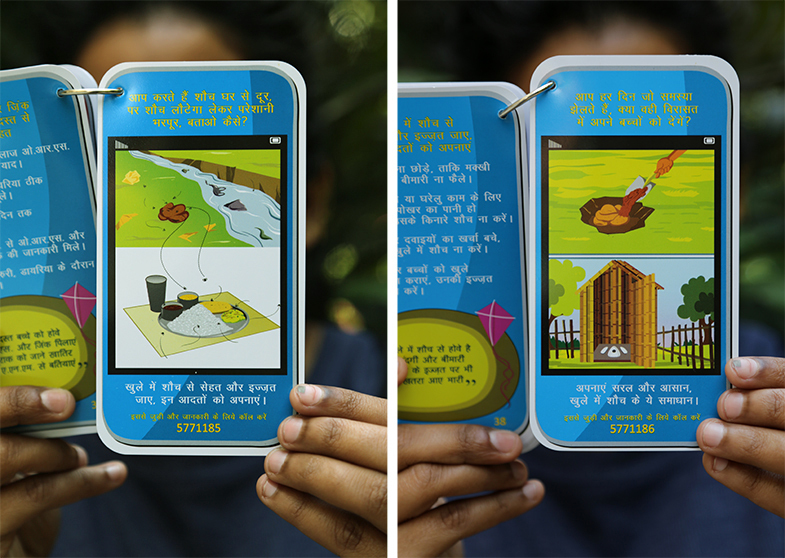 Created by Anaya and BBC Media Action so far the project has been launched in Bihar, Odisha and Uttar Pradesh. A deck of 40 cards go, quite literally, hand-in-hand with pre-recorded audio clips accessible from a basic mobile phone. The cards contain information on the crucial early stages of pre and post-natal health care, breaking down a vast subject into eight important behaviours and over 100 points which encourage attitude change. Each point is visualised as an illustration on the front of the card above a mobile shortcode. Dialing this code takes the health worker through to an audio recording of Dr Anita or her assistant, the authority figures created to to convey short messages of important information to the families. These authority figures were created to build trust in the families who often lack access to larger professional health care institutions. In Bihar, for example, the ratio of doctors to patients is 1:3,500 (the national average in 2013 was 1:1,700). On the back of the card the key content is summarised along with a lightly written couplet also repeated in the accompanying recording. People, earlier, might even say to me – we don’t believe you; you are doing this just to earn money… but, now when I visit families along with my Mobile Kunji, they pull out chairs, invite me to sit, and gather around me. The cards act as both a ‘job aid’, supporting health workers to provide standardised, credible information and increasing their confidence, whilst also helping to build the trust of the families they visit. 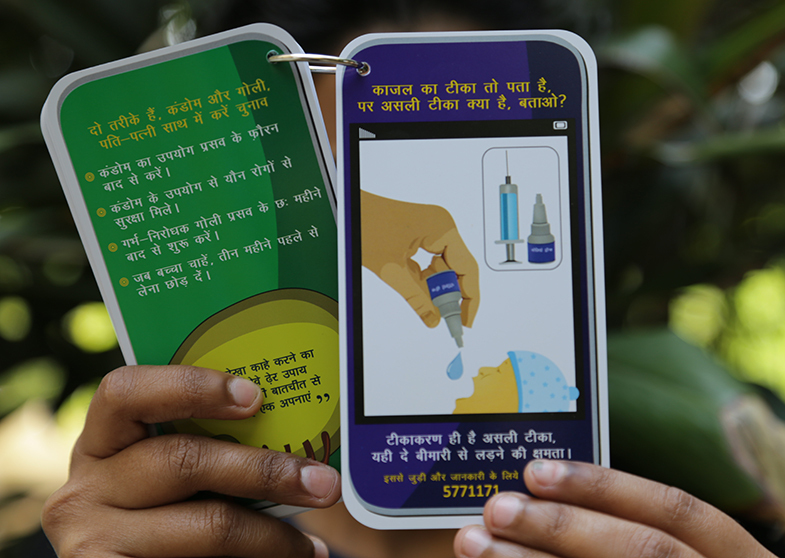 The project addresses both practical and more systematic problems the health workers face. The need for something that could be carried easily on home visits, for example, alongside the need for a substantial amount of accurate and standardised information, and the the need for a tool which values and empowers the health worker role rather than replaces it. The strength of the visual material is how it subtly facilities both the verbal communication of the healthcare worker and communicates the content of the card. 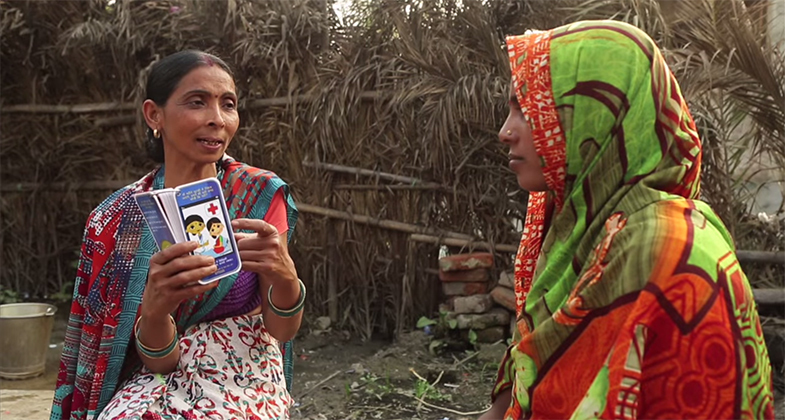 The single steel ring binding means that each card can be read by both the families and health worker simultaneously. 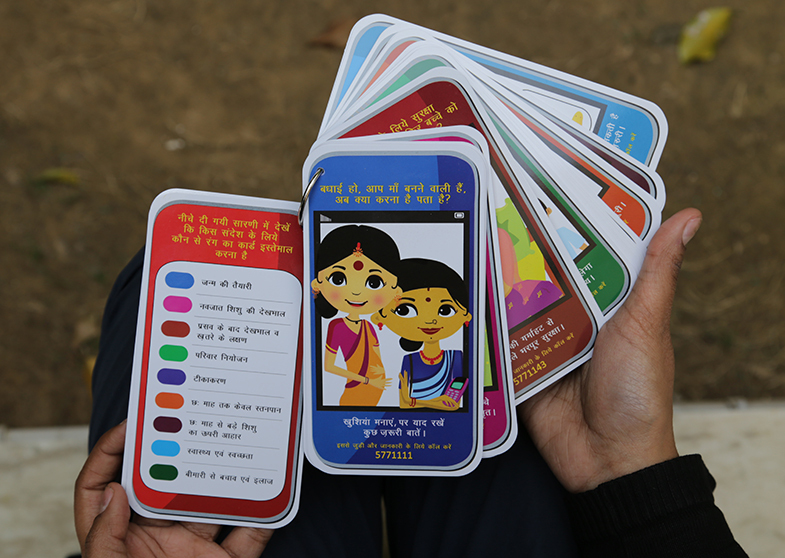 The cards are colour-coded so that the 40 sheets are easily navigable for health workers who typically spend on average 10–15 minutes on a visit. Since the whole deck is compact – no bigger than a large smartphone – it fits easily in a handbag, making it more likely that it will be used on home visits. 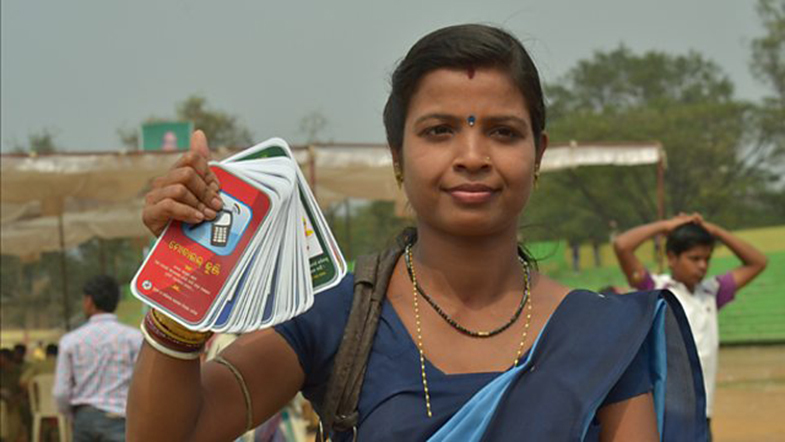 Like the voice of Dr Anita, the aesthetic of the cards is open and unintimidating, helped by the bold spectrum of colours which are not trend-based or too somber, nor the typical go-to colours of the healthcare industry. But why have a visual element at all? The cards help clarify what is being said and heard, helping the audience to visualise the message as tangible scenarios. Coupled with the recordings, the aid is flexible for the health worker and acknowledges that communication styles should and will differ depending on the person delivering the message, and of course the recipient. 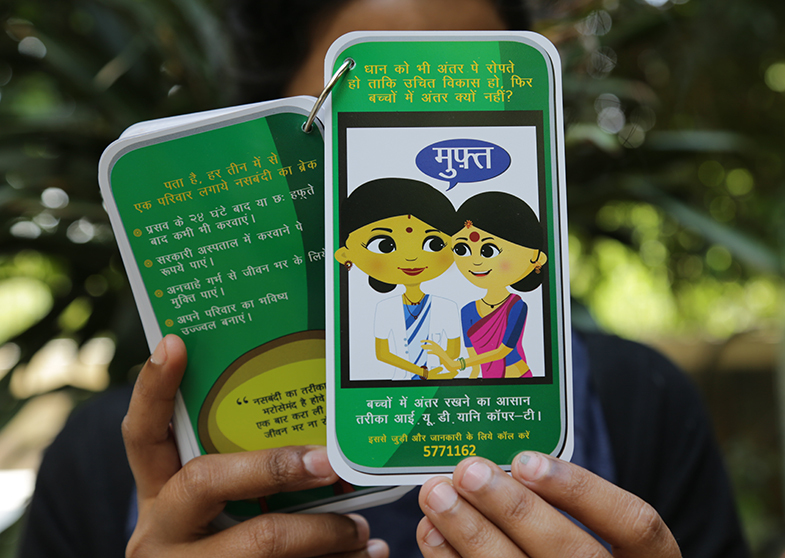 Mobile Kunji demonstrates a well-executed process of understanding a need and addressing it with considered form and function, a strong example of how a piece of visual communication can support and enhance interpersonal communication, not replace it. Images courtesy of Codesign and BBC Media Action.